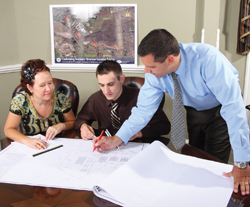 Today’s developers know that choosing the right civil engineering firm is critical to bringing projects to fruition. A firm’s qualifications, capabilities, and track record are all important. Also, today, we have the added complexity of public-at-large and interest groups that are savvy and vocal when it comes to analyzing the impact of new building projects in their community. We are a communications savvy engineering firm, experienced in presenting our work to a variety of audiences. NO MATTER HOW YOU LOOK AT IT, THE BAR IS SET HIGHER. Residents and neighbors want good development and they demand well-planned projects that are appropriate and properly take into account any potential issues whether environmental or aesthetic that affect the community-at-large. For KCE, Monmouth County is more than our place of business. It is our home. Our reputation is on the line with every project that has our name on it. A successful project is more than getting drawings approved and accepted. Often, that is only the beginning. We stand by our work and guide you through the process as quickly as possible. Our professional and technical staff has been working together for years to provide integrated solutions for diverse, multi-disciplinary projects. Our goal is to exceed client expectations one project at a time. Our project engineers give their full attention to each project. Our goal is to have projects designed right the first time and completed as quickly as feasible. Our business growth over the past decade has been either repeat business from our current clients or recommendations from developers, architects, and land use attorneys who have used our services. Every development project involves a team including architects, attorneys, engineers, and technical specialists. KCE has developed strong working relationships with a number of Monmouth County architects, builders, and real estate attorneys so the communication channels are already in place. Put this all together and you have a civil engineering firm with the know-how to get your project from design to construction in the shortest possible time-frame. KCE has a proven track record of financially and technically successful engineering projects throughout New Jersey. While our energies and resources have taken us to virtually every county from Sussex to Cape May, our roots lie in Monmouth County. Here, we know the terrain, both literally and figuratively so our technical staff is already one step ahead for any new project. efficiently meet our clients’ goals. We have facilitated the numerous permits required by the NJDEP, the US Army Corp of Engineers, as well as most county and local regulatory bodies. Our ongoing dealings with these agencies and our working relationship with the reviewers often make all the difference when expediting the approval process. To find out how KCE will help you meet your engineering and land development needs, please contact us!